Chia seed is a plant, from Salvia type, belonging to the mint family (Lamiaceae). Chia is native to the central valley of Mexico. Grown and consumed by the Aztecs for thousands of years, chia would significantly reduce the risk of cardiovascular disease, diabetes and obesity. Chia is a gluten-free food. It typically contains 30% high quality protein, 30% fiber (mostly soluble) and a significant level of antioxidants. This combination of elements helps preserve the oil (full of Omega 3) in the seed and prevent development of rancidity. So this makes for a stable product with a lifetime total of 18 months. The Chia is a super food full and energized! 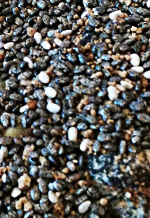 Did you know that Chia seed is commercially available food that naturally contains the Omega-3 over the world? Two tablespoons of chia daily are enough to supply the body with 100% of the required amount of omega-3 to remove a host of heart problems. Chia has the highest fiber content among foods known. The same two tablespoons daily alone provide 30% of daily fiber needs. No more problems with constipation, no more ups and downs of sugar in diabetics and finished food cravings. Chia absorbs indeed 14 times its weight in water: it slows down digestion and the release of sugars in the body and creates, finally, a prolonged sensation of satiety. Taken with breakfast, the cereal reduces the need for sugar, which stimulates hunger throughout the day. Chia contains, in addition, no gluten and is suitable for people who are allergic.